This industry gold standard Cylinder Implant is built to achieve stability and serve as an anchor for a stable reconstruction. 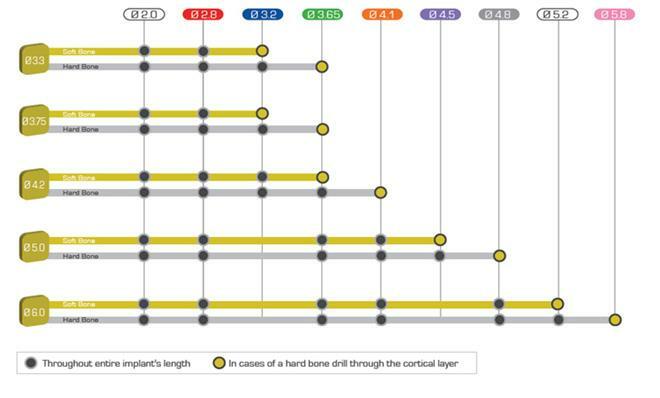 Cylinder implant is recommended for use in cases of particularly hard bone, or limited vertical bone volume, but functions well in all other cases. 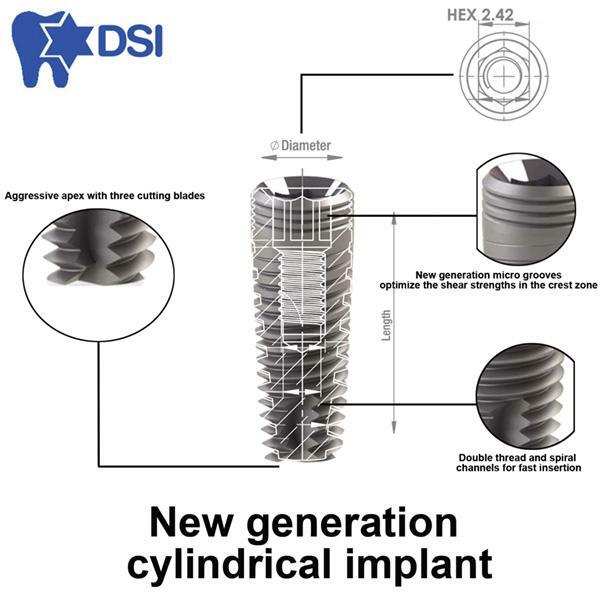 Cylindrical implants has been around for many years and it is a classic and reliable product. It enables smaller osteotomy resulting in minimal bone loss and reduces trauma. It's unique geometric structure and core design, that provides minimal pressure on hard bone, ensuring outstanding primary and long term stability. Self-taping: three cutting flutes are designed to engage the bone immediately during placement and ensure multi-directional locking. The tapping head cuts into the bone with far less friction due to the relief design of the cutting edge. Smooth tri-dome apical part is gentle to anatomical structures. Smooth and controlled insertion of implant (according to the recommended drilling protocol) due to straight wall structure. followed by micro-roughness of approximately 2–4 μm upon acid etching. which can bring a harmful long-term consequences, resulted by the chemicals break-up. We use only natural components such as citric acid to provide maximum bio compatibility without compromising the process quality. and reduce the activity of bone-destroying cells (osteoclasts). hundreds of thousands of implants manufactured and succesfully implanted worldwide. The info presented in current drilling protocol, is based on wast experience collected by specialists using our implants all over the world. the patient’s jaw implant transpires with the beginning and there may be changes according to the situation. We recommend using a drill with diameter slightly smaller than the implant, in the case of soft bone condition. and ensure rapid bone building around the implant. :: Height: 1mm, 2mm, 3mm, 4mm. :: For the implants and all prosthetics are compatible with all Interna-Hex System, Such as: Alpha-Bio, A.B , ZIMMER,Adin, Cortex, MIS and more. :: Fixation Screw is Included!